Have you ever been using a little blender to try to grind a spice mix, or make a smooth, icy pina colada, only to have the wimpy blades do an imperfect job or, worse, burn out its motor? What about trying to make bread or pizza dough in a food processor that simply cannot hold the volume of dough you’re looking to make? I can speak from personal experience that these things happen, and whether you’re a professional chef or a home cook, it’s frustrating! The solution? Upgrade your kitchen hardware to a 12-Cup Cuisinart Elite Collection Food Processor. Pros/Features: There’s tons of features on these sleek, beautiful machines, which means you can do just about anything with them. Comes with three blade attachments and two disc attachments, one for slicing and one for shredding. There is a large and small stainless steel chopping and mixing blade for the large and small bowls, and a plastic dough blade designed to take the work out of kneading dough. All parts, with the exception of the housing base, are dishwasher safe, so cleaning your Cuisinart is super easy. 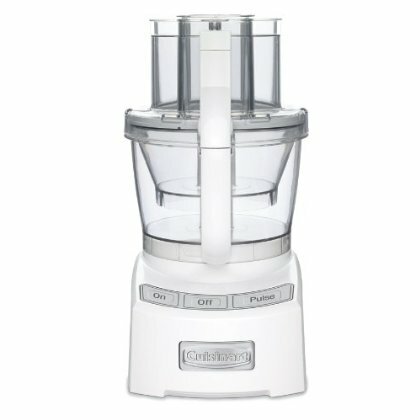 Cons: The downsides to the 12-Cup Cuisinart Elite Collection Food Processor are mostly related to its size. Bottom Line: The 12-Cup Cuisinart Elite Collection Food Processor retails for $249.99, making it an investment, for sure. But, given the quality of the machine, I would say it is definitely worth the price. If you take good care of this machine, you will have a slicer, blender, shredder, dough-kneader, and food processor that you won’t need to replace for a long, long time.